Have you ever had times where you’ve been challenged, where there’s been something that you know you can do much, much better if you just cracked a little piece of technique, if somebody simply showed you how? Yes? It’s true for all of us, and one of my blind spots used to be French style patisserie. I’ve made all sorts of things like this before, and I’ve always ended up with reasonably tasty bread, but the results felt like they could have been … tidier. My croissants looked a bit scratty, a bit too rustic, not French enough. I just needed showing how to roll them out properly, how to form them into a shape that let those glorious laminated layers of butter explode outwards instead of collapsing in on themselves. So, I took a little trip up the Colne valley to a small town called Slaithwaite (it’s pronounced ‘Slaw-itt’ by the locals, and incorrectly by everybody else) to learn how to make French patisserie properly. It seems incongruous, French patisserie in a sleepy town on the edge of Huddersfield, but there lies beside the canal in Slaithwaite one of the most wonderful bakeries in the country. 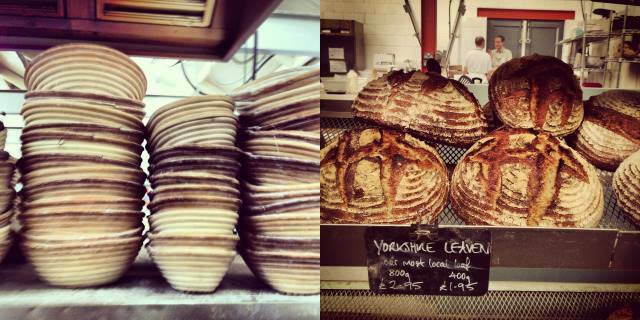 The Handmade Bakery is a co-operative, run as a not-for-profit, by the people, for the people. It’s funded through an innovative bread subscription service, walk-in trade, a café, a series of courses and a small amount of supply to other co-ops and mutuals. This is all done under the simple guiding principle of helping people reconnect with the food they eat, and as a way of rescuing a dying art for the town. The bakery is run in classic Slow terms – loaves aren’t rushed through their development in the same way that commercial bread is produced … if a loaf takes 16 hours to make, start to finish, then so be it. The benefits are there in the taste. Looking at some of those loaves, you can see the time, the care, the love that’s been poured into them. You can see the slight smile of satisfaction on the baker’s lips as he pushes a glorious sourdough loaf on to a rack in the shop, as he watches it being pounced on by a hungry customer, their eyes connecting as the bread changes hands. Nothing is said, but nothing needs to be said. I’ve written a lot about the importance of bread before. Making bread is a necessity to me. It’s my way of decompressing life and slowing it down. Here’s a bakery that’s run on just those terms. And now, after a day of quite expert tuition from a pair of endlessly patient tutors, my repertoire is much wider. We made croissants, pain au raisin, pain au chocolate and a couple of other examples of classic French patisserie, all from the same base dough, a dough that we mixed from the ground up, stepping through the precise and tricky process of laminating butter into the mix, to get those vital light layers that explode apart in the oven as the dough rises proudly. It’s a hard process, with lots of technique involved, and plenty of ways for it to go wrong, but we were left with a clear understanding of the way to do it and the reasons why, and most importantly, with a sheet of croissant dough to cut up, shape, bake and take home for breakfast the next day. The Slow culture at The Handmade Bakery extends into their patisserie, too. It’s made using a pre-fermented dough, which simply means that a portion of the dough is mixed the night before and allowed to develop for an extended period of time. This pre-fermented mixture, bubbling with yeast, is then used as the base for the actual dough, and it benefits it immeasurably, adding depth and flavour. It’s a technique that simply wouldn’t cut in a mass production bakery, but it produces stunning results because of the use of one ingredient the commercials don’t have available to them – time. This type of course can be hit and miss – often, the people leading it aren’t used to teaching, or can’t explain themselves clearly enough. Other times, things turn into more of a demonstration, when practical, hands-on experience would’ve been a better way to learn. There were none of those problems at The Handmade Bakery … the day was packed with activity, advice, guidance, and was carefully thought through so that we’d leave with a big bag of the things we’d made completely from scratch. There was plenty of time over lunch, and over huge Finnish pulla cakes in the afternoon, to talk about bread and about what we were learning with our bakers, to talk about what it meant to them and to us, which they did with passion and enthusiasm. That sort of enthusiasm is infectious, and the seeds of inspiration were clearly planted in several minds. It was very impressive, and more than worth the £120 I paid for it, because my eagerness for French baking has been kick-started with some considerable force. Artisan bread is made with time. So are the happiest people. is a great place to start), or you could meander over to Slaithwate, take a course, or just buy a loaf of bread and sit by the canal for a while, just watching things happen. What a wonderful post. You’ve just made me put this class firmly at the top of my ‘things to learn’ wish list. I’ve eaten the gorgeous bread from The Handmade Bakery before but didn’t realise they did courses! Slow is a philosophy and way of living that I love and I’m trying very hard to live a little more ‘Slowly’ myself. I completely agree that ‘In Praise of Slow’ is a great book to read; it’s one I return to again and again. Just looked at the photos again so now I’m of to dream of patisserie. Is the food labelling traffic light scheme a hit or miss?